Croatia is a country easy to fall in love with. With its 3600 miles of seafront and more than 1100 islands and islets, its amazing cultural heritage and some of the most beautiful national parks in Europe it’s a destination which deserves its place on every bucket list. At least, it was very high on ours. And it’s still there. Because two visits, a really short one and a longer one were only enough to get a taste of Croatia and get eager for more! We’ve already mentioned some of the highlights of our Croatian trips on the blog. 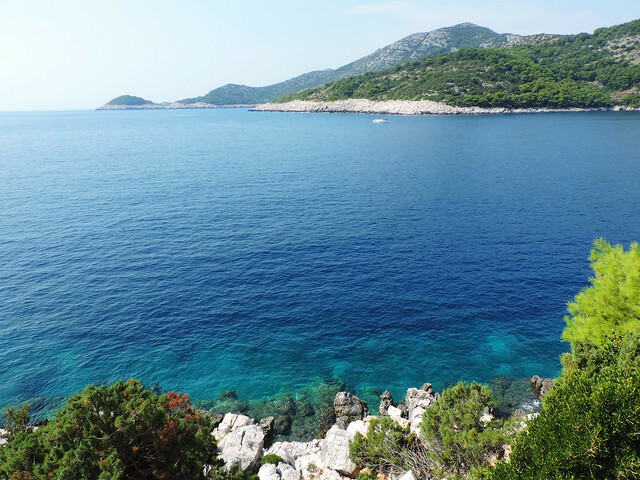 But now it’s time to write about our favorite island in detail: Mljet. One of the several hundreds of islands located along Croatia’s Adriatic coast. But what a magical one! Mljet is a tiny island in Southern Dalmatia with the length of 37 kilometres (23 miles) and an average width of 3.2 kilometres (2 miles). Almost 90% of the island is forest. Those so very green evergreen pines (they are called Aleppo pines) make the whole island look so green! Our first impression of Mljet was that it’s so beautifully green and it was our last impression, too, as the ferry left its shores on our way back. 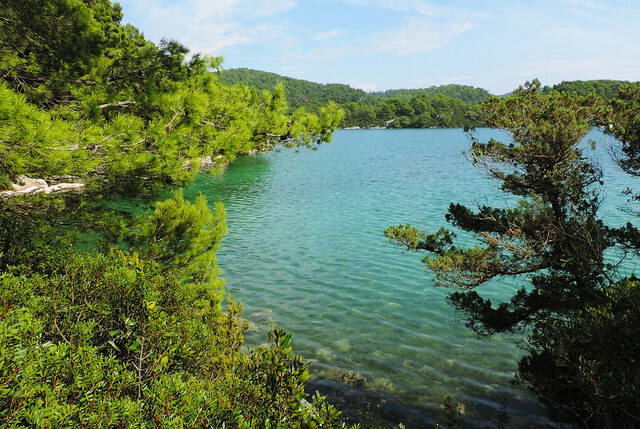 Okay, the pine forests of Mljet are among the most preserved forests of that type in the whole Mediterranean and they are beautiful. What else? Everything else, actually! High cliffs on the shore, azure and turquoise bays, perfectly sandy beaches, caves, tons of small islets, tiny villages, two salt lakes… And nature. Wild, untouched, amazing nature around us. We prefer the solitude and beauty nature can offer to the busy vibe of cities. For us the perfect bays and beaches are those far from noise and crowd. And that’s exactly what we found in Mljet. 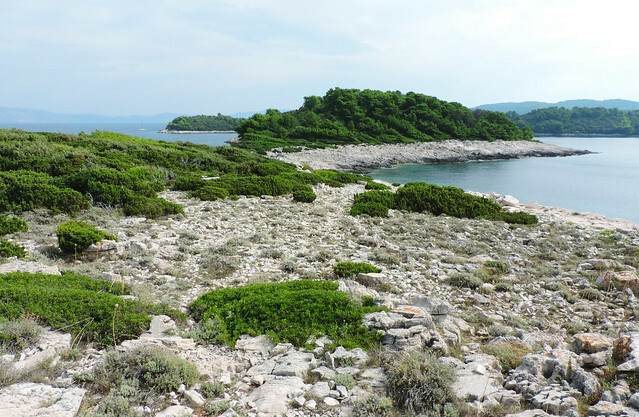 The western part of Mljet is actually Mljet National Park. It’s famous for its two salt lakes called Malo Jezero and Veliko Jezero (Small Lake and Great Lake in English) that are filled with seawater. They are not just interesting phenomena but also great for swimming and kayaking or just walking around the lakes. There’s a small island called St. Mary on Veliko Jezero. Island on the island. 🙂 And what could people do on small islands? Build a monastery, of course. We’ve seen two other tiny islands with monasteries just this summer (Lokrum Island near Dubrovnik and Bled Island in Slovenia). It’s a Benedictine monastery in this case. The loop trail around the two lakes is nice and easy and we could choose our private beaches on the way. Okay, these beaches were rather huge flat cliffs hidden under the trees but really every couple and family had their own little hidden area on the lakeshore. We loved the lakes even more because their water is a bit warmer than the sea. And have I already mentioned their color? Guess what, it’s beautiful green. We spent 2 days on Mljet and we drove all along the island from the very west to the very east. Okay, it was 2 very long days. God, we got up at 5 am to catch the first ferry! Not that we regret it. Mljet really deserved every moment we’ve spent there. Sure, there’s still a lot more to see there especially if you love snorkeling, swimming and hiking. Or just being lazy on pretty beaches. But if you only have 2-3 days you are still good to see the highlights of Mljet. 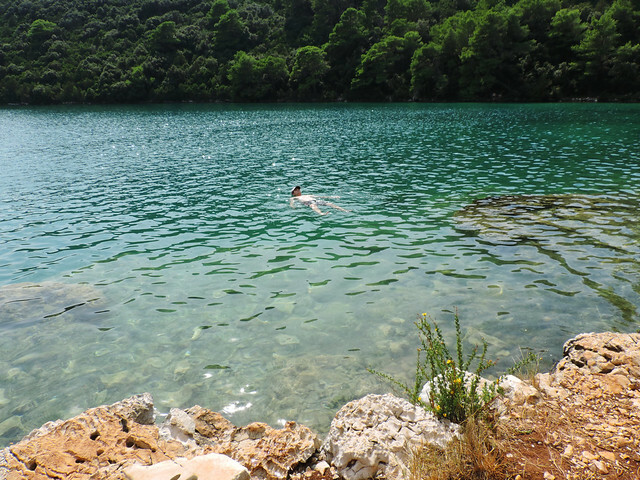 I already mentioned how much we loved the salt lakes of Mljet National Park: Malo Jezero and Veliko Jezero. 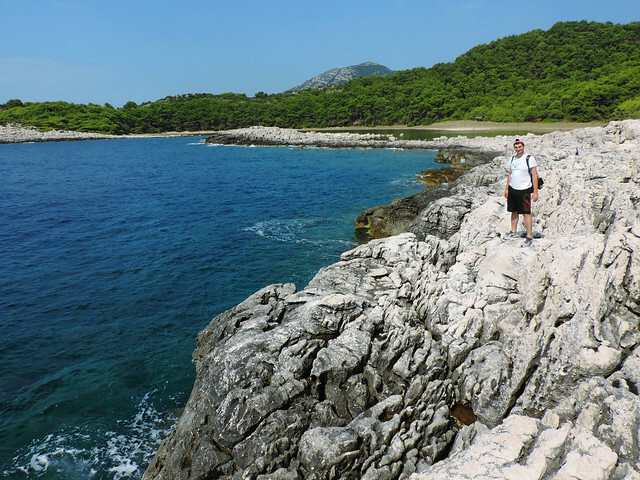 But we also liked hiking in Mljet National Park, especially the loop trail around the lakes and the trails along the coastline. 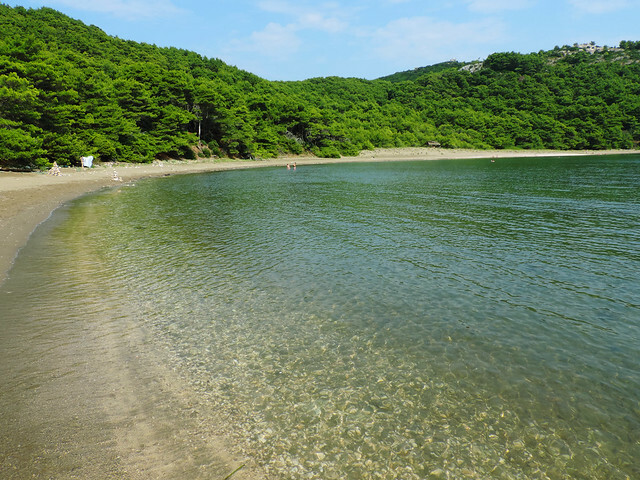 We have a favorite spot on the east part of Mljet, too: Blace Beach. 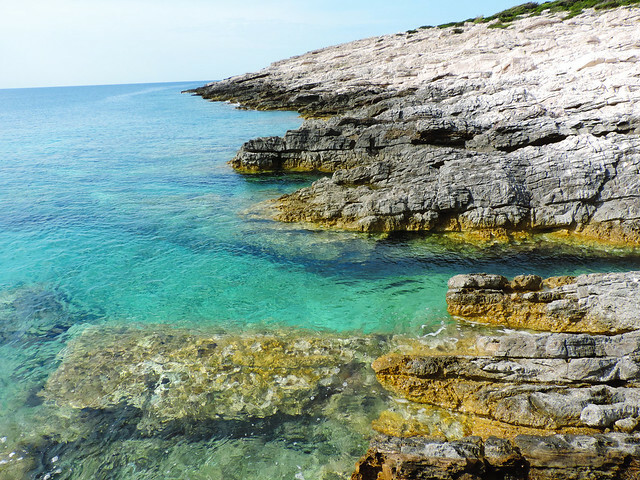 It’s a protected bay with shallow (and warmer) water and it’s one of the few perfectly sandy beaches in Croatia. The bay is close to Saplunara Beach but we walked about 20 minutes on a dirt road from Saplunara to reach Blace Beach. More hidden, less crowded and there’s just you, the green and the blue there. There’s a two-lane paved road running through Mljet and getting from the west to the east took us about an hour by car. But with all the great views it seemed even less. It’s green, green and green everywhere. And views of small islets and bays from above. 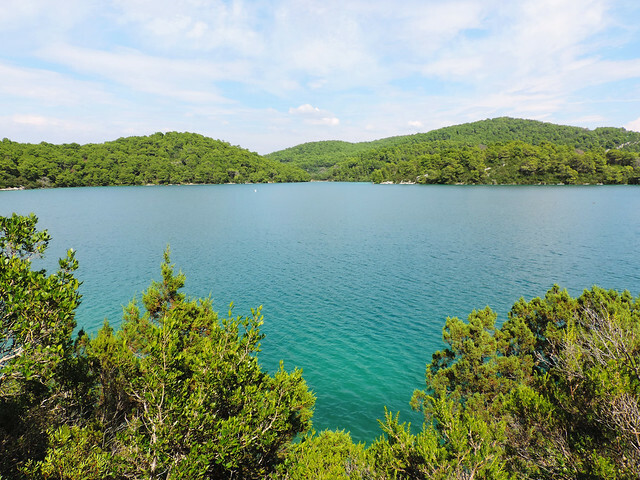 We definitely recommend exploring Mljet by car – going there by car or renting one at the ferry port. Unless you have a yacht (if that’s the case I just want to let you know that we are happy to join you anytime 😛 ). Scheduled buses travel just once or twice a day. If you are interested in car rental click here for deals and more info about driving in Croatia! I would say Mljet is medium difficulty in terms of access. Some islands in Croatia are connected to the mainland by bridge and they are easy to get to. Some are connected to the mainland by ferry lines – like Mljet. That’s what we call medium difficulty because you have to check the ferry schedule and it’s also more expensive. Mljet has ferry lines with Pelješac peninsula and Dubrovnik. You can check the schedule and prices on the official page of Jadrolinija ferry service. We took the ferry from Prapratno (Pelješac peninsula) to Sobra (small port on Mljet) which was a 40 minutes long journey. Mljet is a small island with limited accommodation so you better book it in time. We stayed in Polače, but there’s several other small towns on the island. Check here for more options! Mljet is a paradise. And it made us excited to see even more of Croatia’s marvelous islands. So what else is out there? Krk and Pag are two famous ones which are connected to the mainland by bridge. Korčula, Hvar, Brač, Vis and Rab are also very popular and they have regular ferry connections with the mainland. Then there’s islands which can’t be accessed by scheduled ferries. Your best and most affordable option to see them is signing up for a day trip organized by tour companies in the bigger ports (Rijeka, Pula, Zadar, Split, Dubrovnik). Two special ones are Brijuni and Kornati Islands which are also national parks. 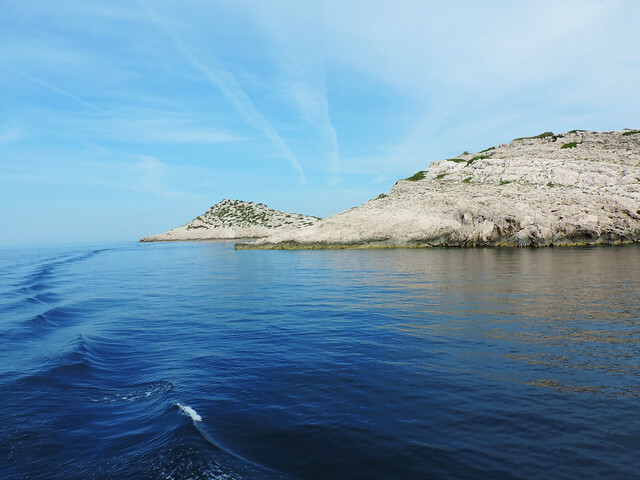 We had a day trip to Kornati Islands from Zadar – read about our experience here! By the way different day trips are organized to a whole lot of islands from the above mentioned big ports and some day trips include visiting 2-3 islands. While more islands on a single day seem a very busy schedule to us, having the option to visit islands like Korčula, Hvar or Brač without using the ferry or renting a car could be a good option if you are short on time. So? Have you been to any of the Croatian islands? Would you go? Previous post 12 Instagrammers That Make You Want To Travel Like Now! We are thinking about a trip to Croatia with our two kids, are considering braving the crowds of Dubrovnik but then want to find a sleepy beach town to stay in for 5 days before moving on to Zadar. Mljet is looking good! We are big nature lovers…Unfortunately we can only come last week of June first week of July and we are reconsidering this whole Croatia adventure because we here the crowds are simply too much! What do you think. Your pictures are absolutely stunning…. Thanks 🙂 Mljet is a pretty island, and we could only recommend it to nature lovers. It also has some kid friendly beaches in protected, shallow, sandy bays.